I finished the Pre-Alpha 1 milestone this week for Pursuit of Power 2. I mainly worked on the computer AI for placing banners so their zealots can march between portals. It was fun to see all of the zealots marching around the board. I added a quick debug counter and saw around 500 zealots active on a simple board with short paths. I think the level of zealot activity definitely added to the immersion of the game. It will be interesting to see how the game shapes-up when I give more complex goals and add the more advanced gameplay options like elite troops. The following screenshot shows a basic board that I use for functional testing of the zealots. 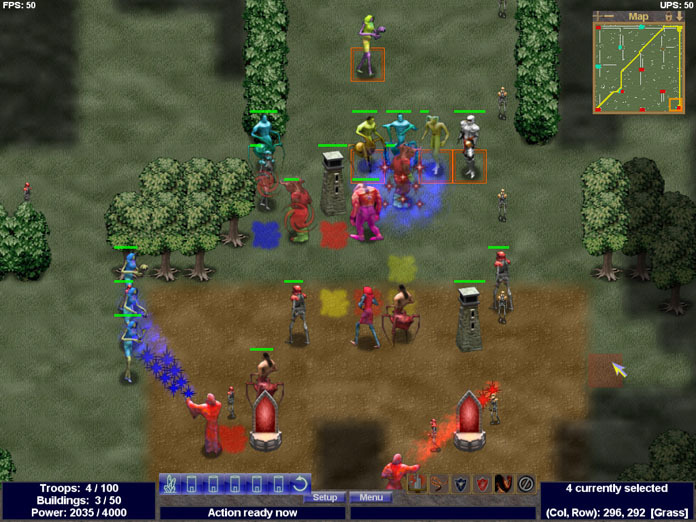 I (in gold) am attacking a pair of enemy portals (in red) with the help of my team member (in blue). You can see some of my gold zealots marching towards the red portal, where the closest one is getting hit with a spell by the enemy wraith. I placed two towers that are picking-off some of the red zealots marching out of the red portals. A few make it out alive and march northwest towards a safer friendly portal. My next milestone will begin with implementing new gameplay mechanics for the fortress. I will start by adding the option for towers and walls that surround the portal. These towers and walls can be upgraded and determine some of the available gameplay options for players. Also, the new fortresses will act as control points, where ownership can change if enough enemy zealots reach a portal. The defensive walls will prevent this change in ownership until they are destroyed. This gameplay enhancement will allow players to move towards enemy fortifications with shorter distances for reinforcements. It should create an interesting flow to the game as well. My zealot C++ class now inherits from the same sentient entity C++ class that is used by my troops, towers, and resources/portals. This gives a lot of additional capabilities including the ability to see dynamic entities as well as fight other sentient entities. At some point I will add another layer between the sentient and dynamic entity C++ classes since I need to reduce memory and functionality for the zealots. With more than 12,000 zealots being allocated, I have to ensure that I’m not wasting too much memory per zealot. I tested out the new attackable zealots and it is cool seeing them interact with the other enemy troops and towers. The zealots generate prestige for their source portal too. I just haven’t done anything with the prestige yet. It will be interesting to see how the game feels when the zealots are able to get players prestige to summon elite units and perform more advanced actions. In addition, I have been thinking about some tweaks to the overall gameplay. I would like to make it so portals are captured by enemy zealots when enough have successfully reached the portal. This will make the game flow better since players can advance towards enemies. I will still provide the option to destroy the portal in order to eliminate points that are hard to control. That way the game doesn’t go on forever. When a player captures a portal, it can be protected against enemy zealots by building fortifications. Each defensive upgrade will make it tougher to capture. Prestige will be a big part of those upgrades. The towers connected to the fortress will help decide what upgrades are possible. Furthermore, when all 4 towers are maxed out, a guardian can be summoned. I want to have some cool particle effects between the fortress towers and portals to indicate the advanced upgrades. This week I will be adding some of the initial computer AI to use the zealots. I will start simple by focusing on generating prestige using friendly portals. This will give me an idea of what the game will look like with lots of zealots marching around the board. I will then work towards more advanced AI such as using zealots for an attack. However, I will probably wait on that part until I implement the fortresses. That way I can go right to the control point concept. I plan to focus mainly on the fortress and related gameplay for most of April. That will also mark the start of the next milestone, which is PRE-ALPHA 2. I wrap up PRE-ALPHA 1 at the end of this month. That will be almost exactly 6 months of progress since my initial prototype. Gotta keep grinding! I have the initial code done for the marching zealots. Selecting an owned portal brings up the action icons, which now include the ability to place a banner at another portal. Clicking on the destination portal starts the zealots marching out of the source portal. The path is highlighted between those portals while the source is selected. In addition, all current zealot paths are displayed on the game map. I will probably add an option to highlight the path between any portals so players can plan defensive positions, ambushes, etc. I still have more code to complete before I can move to the next gameplay mechanic. For example, I need to make the zealots attackable and have the ability to see around them. I will inherit a different C++ class that has some of those properties and then tailor it to fit the mechanics of the zealots. I need to save the current zealot paths and states too. I should have the remaining required code and initial computer AI completed within the next 4 weeks. The current design will allow for 12,000 zealots to exist within a game. The max number would only happen with very large games under extreme situations, but the game should handle it. In most cases, there will be at least hundreds of zealots marching between portals at any given time. I hope that they help make the game feel alive with action. Using them effectively will be vital to winning the game. Sending zealots to ally portals will not only generate prestige, but also allow trading important resources that help to speed up the tech tree progression. Furthermore, zealots will be the only type of troop that can damage enemy portals. They will gain additional bonus prestige too when they damage an enemy portal. As prestige is gained, players can choose upgrades and summon elite troops. Even zealots can be upgraded to several different tiers. Each tier will improve the abilities of the zealots. The first zealot type will be passive and easily destroyed. The next tier will be much tougher to kill. The third tier will have a reactive ability that damages the attacker when the zealot is killed. This will make it dangerous for enemy troops to attack those types of zealots, leaving the job better suited to towers. Upgraded towers will also be important to defend against guardians. After a portal fortress has been upgraded with all 4 towers, it can summon a powerful guardian at the cost of prestige. The creature will provide a strong defense against attackers. The guardian is a special type of zealot that can even be sent to attack an enemy portal. This will cause the guardian to materialize and fly along the zealot path, wreaking havoc on all enemies as it flies by them. The guardian will pummel the enemy portal until it is killed or the portal is destroyed. The gameplay design is becoming much more clear as I make progress on the gameplay mechanics. I think it is shaping up nicely and I am on schedule so far. I will continue to reveal gameplay details over the next few blog posts. At some point I will update the web site too. Thanks for reading! You are currently browsing the Developer’s Journal blog archives for March, 2013.